Facebook does not allow to copy text from Facebook app. Yes, you must have experienced this. Generally, on Android or iPhone you can copy any text by holding the text for some time than with a copy option appears but in Facebook app you can’t. So I thought why not to find a way for it and here I come with the solution How to copy text from Facebook app on Android , iPhone or any other smartphone. Many time I wish to copy some post or status from FB app and want to share it on Whatsapp but the Facebook app does not allow you to copy text from Android or iPhone app. So it is irritating sometimes, you can not copy status and if you have some important information then you have to either type it again or switch to the desktop version of Facebook. Now in Facebook Android app you can copy text easily without any third-party app. Just hold the text and it will pop up a copy button. But if that does not work for you then you can use this trick. Well, here I have a solution for it now you can copy text from fb app with this simple trick. There are many methods to copy text from Facebook on Android and iPhone. Let’s start with simple methods. Method 1: The simplest way to copy text from Facebook on iPhone or copy text from Facebook on Android is by using a mobile browser. Just Open your Mobile browser and log in to Facebook in it. Now you will able to copy any text from Facebook and this method works for all Android, iPhone or Windows Phone. Method 2: Another method to Copy paste text from Facebook App on Android and iPhone is by installing apps that allow you to copy text from other apps. Both iPhone and Android had such apps. Copy Paste : This is an Android App to Copy text from any application and pastes it in “Copy Paste” clipboard with a single click. 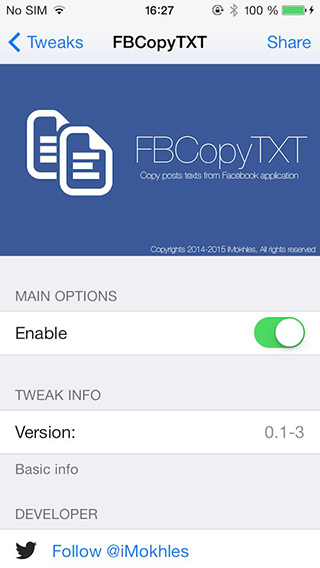 FBcopyTXT : It is an iPhone or IOS app that allows you to copy text from Facebook app on iPhone. With long press gesture, you can copy text from facebook app. Method 3: This method requires Facebook Messenger App to copy paste text from Fb app. So to use this method first install the FB Messenger app on your Android or iPhone. 1. Now Open your Facebook app on your Android phone or iPhone. Choose the post that you want to copy. 2. Now tap the share button below the post. 3. Now again Click on Share. Now tap the ” Copy Link to Post ” option. 4. Now open your FB Messenger app and start a new chat for yourself. Now paste the link copied here. 5. Now Open that link in the Messanger. 6. Now just try to copy from here. I am sure you will able to copy now. Now you can paste this copied text to anywhere like you want to share on Whatsapp with your friend or want to make its note. So these are all simple methods to copy text from facebook app. Now you can copy any status from facebook app on Android or iPhone. If you still find any problem is copying text from the Facebook app you can comment below. we will happy to help you. thanks Dharmesh. Really helped…..was getting frustrated about not being able to copy text from FB.